I’ve been fortunate this summer. I’ve had the opportunity to spend 6 weeks in the Rocky Mountains photographing Colorado landscapes and wildflowers. One of the great hikes on my bucket list, both for Colorado images and simply for hiking pleasure, is the Ice Lakes hike that originates near Silverton. For this hike, my wife was able to join me. She’s not a big outdoors person like I am, but she is a Colorado native. She also understands that as a professional photographer, I have to start these treks when it is still dark outside so I can be in a good location at sunrise. But this time I let her sleep a little later in our Ouray hotel room, setting the alarm clock for 3:45am. We were on the trail, which starts 5 miles down South Mineral Road at the South Mineral campground by 4:45am. An hour of walking in the dark slowly gave way to light, and we soon found ourselves within sight of Ice Lake. The meadows to our right were sprinkled with columbine, aspen daisies, and chiming bells. We had already gained ~1600 vertical feet and now continued onto Upper Ice Lake. Here you gain another 700 vertical feet in a little over a half-mile. From Upper Ice Lake we followed a small ridge over to the real jewel, Island Lake. With Grant Peak, Fuller Peak, Vermillion Peak, Golden Horn, and Pilot Knob rising in the distance, the brilliant turquoise waters of Island Lake rest in a beautiful cirque. Island Lake sits atop the beautiful Ice Lakes hike, offering the opportunity for landscape images in the Colorado high country. We lingered here a while with no one else in sight, enjoying this remote San Juan Mountains landscape for nearly 45 minutes. I took the opportunity to photograph the lake from several angles, and we enjoyed the wildflowers that clung to the steep slopes leading to the water’s edge. I did not want to leave, but all good things must eventually come to an end, and we grabbed our backpacks and headed back down the mountains. On the way down I we stopped several more tomes to capture the moment with my camera. We also passed more than several folks on their way up, including two young men who said they were planning on swimming in Ice Lake. Brrrrr! 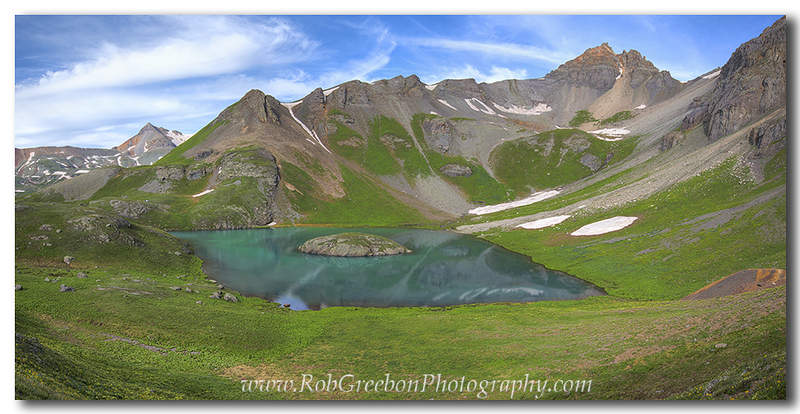 The Ice Lakes hike quickly became one of my favorite Colorado hikes, as well as a top location for summer wildflowers. I look forward to my return in the coming years. Also, feel free to follow my current photography on facebook. Taking a break from the Texas heat, this summer, I’ve been in the Rocky Mountains shooting Colorado wildflowers and landscapes. Some of these photographs are already on my Colorado Images gallery, and many are yet to be posted (feel free to check out these sites). I will update the galleries as I work my way through the photos. 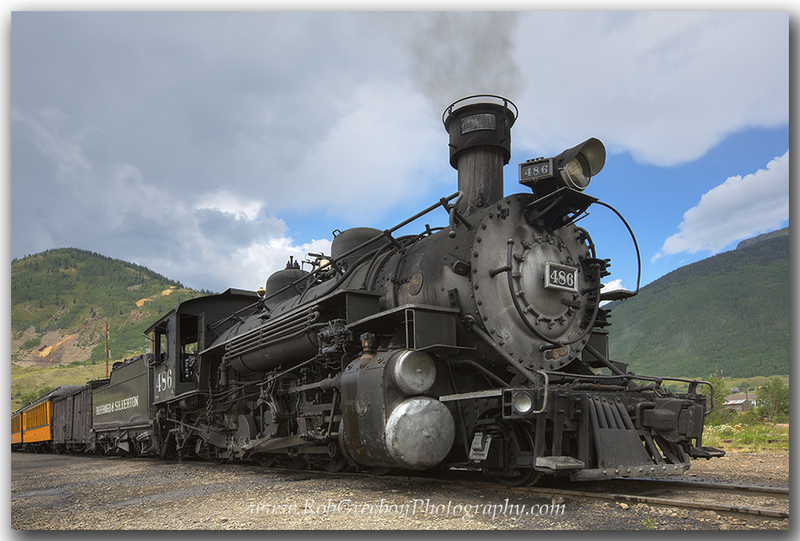 While I was down in the San Juans near Durango, Silverton, and Ouray last week, I had the chance to meet up with my family and, for the first time, ride the Narrow Gauge Railroad and take in the vistas this trip provided. The Narrow Gauge Railroad offers great views of the Colorado landscape, as well as opportunities to capture unique images. The Narrow Gauge Railroad allows you to step back in history and enjoy a trek through some of Colorado’s most beautiful landscapes. The town of Durango was founded by the railroad, and the narrow gauge railroad between Durango and Silverton was constructed in only 9 months – completed in 1881. And if you’ve ridden this train, you’ll know that seems quite a feat. Built to transport gold and silver ore out of the San Juans, it was quickly discovered that this trip offered great views. The 52 mile track follows the Animas River, winding through lush valleys and over high rising rock cuts that allow you to see mountains in all directions. Each way, the train is 3.5 hours and makes for a great way to spend the afternoon. The folks working on the train seemed to be college students (at least the two I talked with) and were both very knowledgeable about the area and willing to share the best turns in the track for photography. 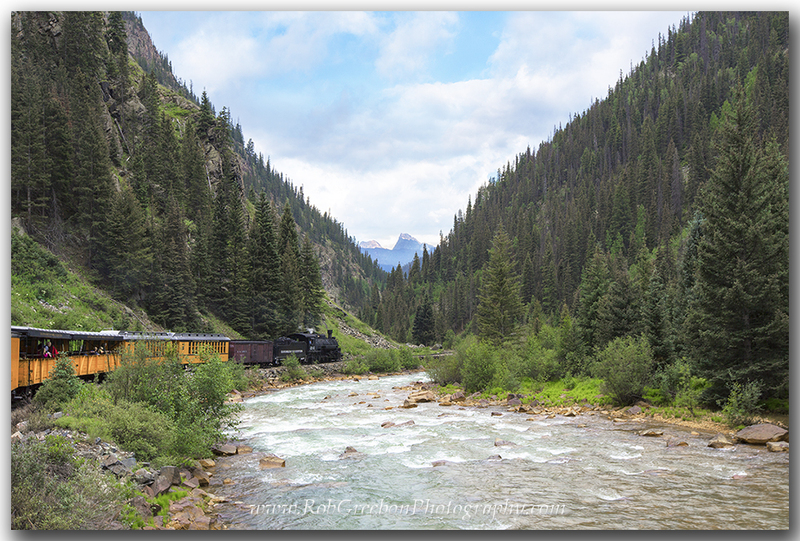 The Narrow Gauge Railroad winds through the valleys along the Animas River between Durango and Siverton, Colorado. I’d definitely go back and ride this again, though I’d have to save my money to do so. It is fairly expensive, but worth the splurge. I’d also like to return and ride the photography train in the winter that allows you to photograph the train as it winds through the snowy forest. I’ll be back with more about this trip, including images from Yankee Boy Basin and the Ice Lakes Hike. Feel free to follow my current photography on my professional facebook page. All images are available for license or as prints. Please visit my photography website for more information. Colorado wildflowers are finally starting to bloom with the advent of warmer summer air and melting snows. I was recently down in the San Juans for a few days, including Crested Butte and Lake City, then up in the Snowmass/Aspen/Maroon Bells area for some work. While there, I was able to photograph the Colorado landscape with some of the wildflowers that are showing. Just outside of Lake City, there is a nice location about 20 miles down a dirt road called American Basin. The road leading to this area gets progressively worse as you near the end, and eventually you’ll need 4WD for the horrid road conditions as well as the stream crossings. But once you arrive, you’ll be glad you did. A meadow with a snow-fed stream flows down from the high Rocky Mountains. About this time of year the meadow fills with colorful wildflowers, including the columbine, daisies, paintbrush, bluebells, as well as many others. 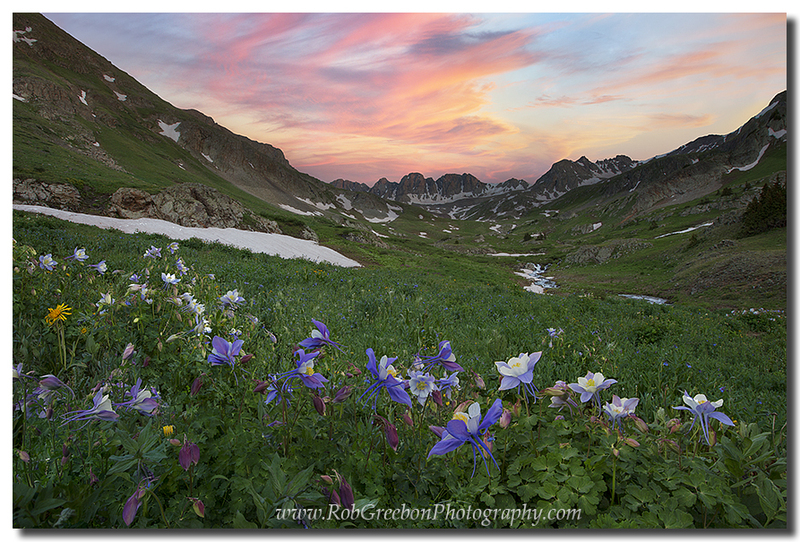 Columbine in American Basin add color to this Colorado Wildflower Landscape image. 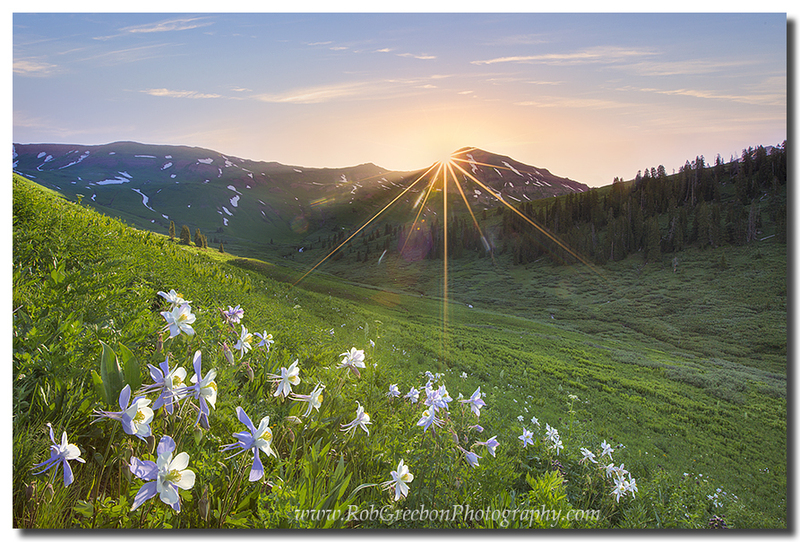 Columbine greet the sun on a perfect morning near Crested Butte in this Colorado wildflower landscape image. After that, I was back in one of my favorite areas, the Maroon Bells Wilderness area. The Columbine along the trail from Crater Lake to Maroon Lake are starting to show. This Colorado image comes from sunrise there as the sun began to light up the Maroon Peaks. 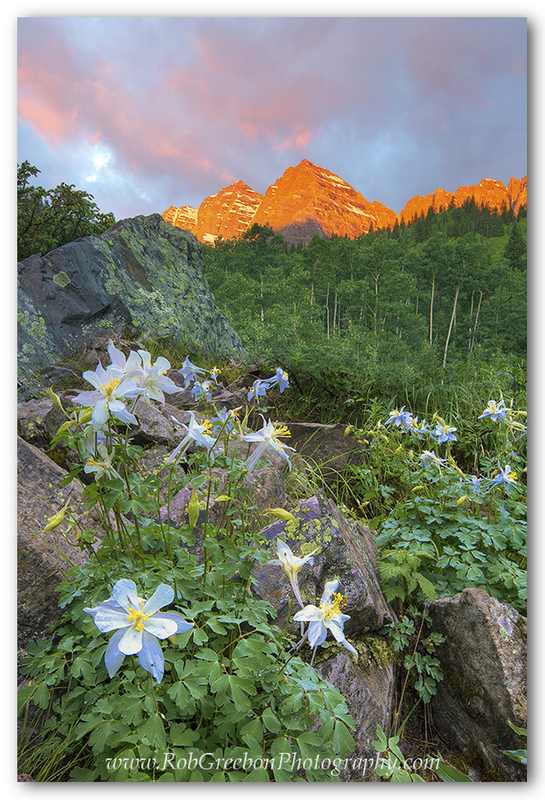 Colorado’s State Wildflower, the Columbine, awakens to the morning as the sun lights up the Maroon Bells in this Colorado image. In the next few weeks, I plan on returning to The Ouray area, including Yankee Boy Basin and the Ice Lakes, specifically for the wildflowers. Also, I post current images on my photography facebook page. I am fortunate to have the opportunity to photograph many locations. I’ve done some work this summer for some folks in Snowmass Village and Aspen. Any anytime I can escape the summer heat of Texas, I’ll take it. One of my favorite times occurs when I am able to return to Colorado for 6 weeks each summer and photograph the wildflowers of Colorado along with other Colorado images. This spring, the Rockies received more than their usual amount of snow, so the wildflowers are a bit late in blooming. Still, that gives me the opportunity to photograph the early bloomers. One such wildflower is the mountain sunflower, also known as the “Old Man of the Mountain.” These Colorado sunflowers are usually the first to appear – often at 11,000-12,500 feet – and almost always above treeline. They are hearty little flowers, hugging the ground to weather the winds and cold and even summer snows. This panorama of these amazing little sunflowers was taken at about 12,000 feet. To reach this point, I had to hike through a swampy forest made wet by melting snows flowing down through an overflowing creek. After that, it was nearly straight up 1000 vertical feet through a boulder field. After a lot of grunting and sweating, the payoff appeared – a ridge along the Continental Divide brimming with golden wildflowers. In the next few weeks, I hope to visit the San Juans – specifically the wildflower areas of American Basin and Yankee Boy Basin. I also hope to stop by the Maroon Bells and Breckenridge’s Mayflower Gulch. In the meantime, feel free to visit my Colorado images or see my Texas Bluebonnets and Wildflowers gallery. I also post current information on my facebook photography page.